I want the police to be better armed than the bad guys, but what exactly does that mean today? Apparently it means the Pentagon and Department of Homeland Security equip even the tiniest rural police departments with massive military vehicles, body armor and grenade launchers. The equipment is surplus from the long wars we fought in Iraq and Afghanistan. To a hammer, everything resembles a nail. SWAT (Special Weapons and Tactics) teams were once used only in emergencies such as riots or robberies where hostages were taken. But today there are more than 50,000 "no-knock raids" a year. It's not because crime got worse. There is less crime today. Crime peaked around 1990 and is now at a 40-year low. But as politicians keep passing new criminal laws, police find new reasons to deploy their heavy equipment. Washington Post reporter Radley Balko points out that they've used SWAT teams to raid such threatening haunts as truck stops with video poker machines, unlicensed barber shops and a frat house where underage drinking was reported. In New York City, these men in black raided standup comedian Joe Lipari's apartment. "I had bad customer service at the Apple Store," Lipari told me in an interview for my upcoming TV special "Policing America." "So I bitched about it on Facebook. I thought I was funny. I quoted 'Fight Club,'" the 1999 movie about bored yuppies who attack parts of consumer culture they hate. "People (on Facebook) were immediately responding that it was obviously from 'Fight Club,'" says Lipari. "It was a good time, until 90 minutes later, a SWAT team knocked on my door. Everyone's got their guns drawn." It took only that long for authorities to deem Lipari a threat and authorize a raid by a dozen armed men. Yet, says Lipari, "if they took 90 seconds to Google me, they would have seen I'm teaching a yoga class in an hour, that I had a comedy show." Lipari has no police record. If he is a threat, so are you. 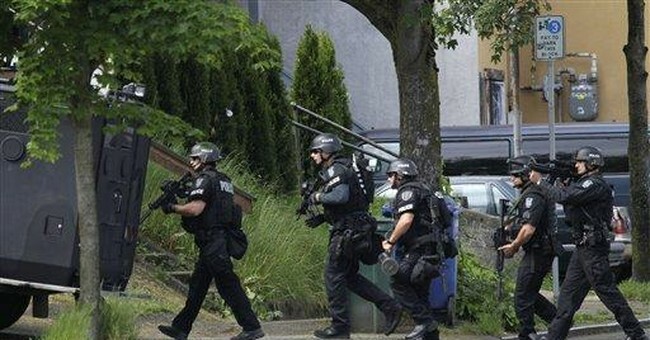 SWAT raids are dangerous, and things often go wrong. People may shoot at the police if they mistake the cops for ordinary criminals and pick up guns to defend their homes against invasion. Sometimes cops kill the frightened homeowner who raises a gun. Because America has so many confusing laws, and also because cops sometimes make mistakes, it's harder to assume -- as conservatives often do -- that as long as you behave yourself, you have nothing to fear. The raids should also trouble libertarians who sometimes believe that government can mostly be trusted when it sticks to "legitimate" functions like running police, courts and the military. Government always grows, and government is force. Force is always dangerous. It's healthy for conservatives, libertarians and liberals alike to worry about the militarization of police. Conservatives worry about a repeat of incidents like the raids on religious radicals at Ruby Ridge and Waco, Texas. Liberals condemn police brutality like the recent asphyxiation death of a suspect at the hands of police in New York. This is a rare issue where I agree with left-wing TV host Bill Maher. On his TV show last week, Maher ranted about no-knock raids "breaking up poker games, arresting low-level pot dealers." Maher's right to point out that most SWAT raids are now done to arrest nonviolent drug offenders. "It's a guy who sells weed," says Maher. "You don't need to shoot his dog and crash through his window." But they do. If cops continue to take a warlike us-versus-them approach to policing the population, they just might bring the left and right together. Government is reckless, whether it is intruding into our lives with byzantine regulations that destroy a fledgling business or with a flash-bang grenade like the one that critically wounded a child in a recent SWAT raid in Janesville, Georgia. Regardless of our political leanings, we should be wary of big government in all its forms.